This article is about a means of public transportation in the Philippines. For the Filipino cable television network, see Jeepney TV. Jeepneys, sometimes called simply jeeps, are the most popular means of public transportation in the Philippines. They are known for their crowded seating and kitsch decorations, which have become a ubiquitous symbol of Philippine culture and art. A Sarao jeepney was exhibited at the Philippine pavilion at the 1964 New York World's Fair as a national image for the Filipinos. Jeepneys were originally made from U.S. military jeeps left over from World War II. The word jeepney may be a portmanteau word – some sources consider it a combination of "jeep" and "jitney", while other sources say "jeep" and "knee", because the passengers sit in very close proximity to each other. Most jeepneys are used as public utility vehicles. Some are used as personal vehicles. Jeepneys are used less often for commercial or institutional use. When American troops began to leave the Philippines at the end of World War II, hundreds of surplus Jeeps were sold or given to the Filipinos. American Soldier, Harry Stonehill, was involved in the disposal of military surplus. He created a black market for the surplus including jeeps. The Jeeps were stripped down and altered locally: metal roofs were added for shade; and the vehicles decorated in vibrant colours with chrome-plated ornaments on the sides and hood. The back saloon was reconfigured with two long parallel benches with passengers facing each other to accommodate more passengers. [lower-alpha 1] The size, length and passenger capacity has increased as it evolved through the years. These were classified as passenger-type jeeps. The non-extended, original-seat configuration jeeps were labeled owners, short for owner-type jeeps, and are used non-commercially. 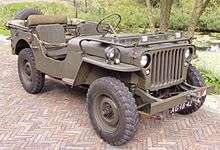 The original Jeepneys were refurbished military Jeeps by Willys and Ford. Modern jeepneys are now produced with surplus engines and other parts coming from Japan. The jeepney rapidly emerged as a popular and creative way to re-establish inexpensive public transportation, much of which had been destroyed during World War II. Recognizing the widespread use of these vehicles, the Philippine government began to regulate their use. Drivers now must have specialized driver's licenses. Routes are regulated and prices are fixed fares. Illegal (unfranchised) operators are officially referred to as "colorum" operations, from the colour of the vehicle plate, which denotes a private rather than public registration. Recently, the jeepney industry has faced threats to its survival. Most of the larger builders have gone bankrupt or have switched to manufacturing other products, with the smaller builders forced to go out of business. Passenger jeepneys are also facing increasing restrictions and regulations for pollution control, as they consume lots of fuel. [lower-alpha 2] A recent study published in a Metro Manila newspaper compared the fuel use of a 16-passenger jeepney to a 54-passenger air-conditioned bus and found that the fuel consumption for both was the same. The planned construction of bus rapid transit (BRT) systems in Manila and Cebu might lead to the removal of jeepneys. In 2016, the Department of Transportation and Communications imposed an age limit on jeepneys of 15 years of age, with older jeepneys starting to be phased out. Many jeepney operators oppose the phase-out, and George San Mateo, leader of the "No to Jeepney Phaseout" Coalition, called the modernization program "corrupt". Leyte Representative Martin Romualdez urged the Land Transportation Franchising and Regulatory Board (LTFRB) to drop its jeepney modernization program. A passad jeepney of Iloilo City. In the central island of Cebu, the bulk of jeepneys are built from second-hand Japanese trucks, originally intended for cargo. These are euphemistically known as "surplus trucks". Popular jeepney manufacturers in Cebu are Chariot and RDAK, known for its "flat-nosed" jeepneys made from surplus Suzuki minivans and Isuzu Elf trucks, which are no longer in use in Japan. 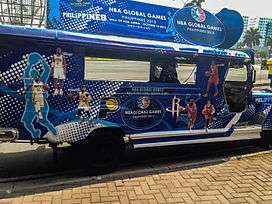 These are equipped with high-powered sound systems, racing themes, and are allegedly bigger and taller than those in Manila. In Iloilo City, jeepneys called passad are known for being replicas of sedans or pickup trucks. The vehicle's body has a much lower profile which resembles more of a sedan chassis with an elongated body. 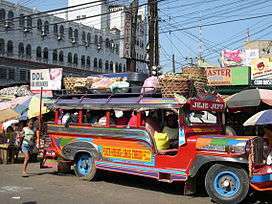 Nelson-type jeepneys are manufactured in Davao City and are known there as "uso-uso". The designs of these jeepneys are very different from the traditional style. These jeepneys feature modern front grille and body designs, lowered ride height, and industrial quality paint jobs. Newer models of Nelson-type jeepneys feature chrome wheels, equipped with radial tubeless tires. They are almost always equipped with a powerful stereo system, so they are often referred to as "mobile discos." Many manufacturers are moving to build modern-looking jeepneys such as Hummer lookalikes and oversized Toyota van-style passenger jeepneys with Toyota headlights, hoods and bumpers. Manufacturers in Nueva Ecija also started making jeepneys with fronts resembling AUVs like the Honda CR-V or the Toyota Tamaraw. In the Cordillera Administrative Region, especially in Baguio City and Benguet province, they have jeeps fitted with truck wheels. Same goes in other parts in Philippines where the road is not cemented or asphalted. Fully assembled with refurbished engines, some also have air-conditioning units, most popularly in Makati City. Most of these jeepneys have radically expanded passenger capacities, and are flamboyant and noisy. Many jeeps from this generation are notorious for belching smoke and almost all run on diesel fuel. Passenger jeepneys from this generation and beyond may employ tailgates especially if they traverse expressways. These are usually rigged mechanically to be controlled from the driver side in lieu of electronic locking systems. These are jeepneys manufactured using new engine components. Many of these come with improved air-conditioning and closely resemble a minibus. Their doors may be situated at the back as a tailgate, or at the front, with doors functioning like that of an actual bus'. Local automobile parts manufacturers are now planning the production of electric jeepneys. Electric jeepneys are now widely deployed in several parts of Metro Manila and in some provinces, either as a staple transportation that completely replaces conventional jeepneys or as service vehicle. The deployments were in response to calls for reduced greenhouse gas emissions and the fluctuations in oil prices. In the future, they will be equipped with tap-and-go card readers, specifically Beep Cards. The brand name that has actually come to mean jeepney is Sarao, the company that first started making them in 1953 and became famous worldwide for doing so. Before the growth of backyard builders, Sarao Motors and Francisco Motors—both in Las Piñas—were the largest manufacturers of jeepneys. At its peak, the ratio of Sarao jeepneys rolling the streets of Manila outnumbered other names by nearly 7 to 1. Today, Sarao Motors is still in business but has downsized its operations, while Francisco Motors has since ceased producing jeepneys. Sarao Motors, Inc. was established by Leonardo S. Sarao of Imus, Cavite who borrowed 700 Philippine pesos to start his own jeepney assembly shop. Because of his contributions to jeepney manufacturing assembly and designs—and for popularizing the jeepney as an established economic industry in the country—Leonardo Sarao received the Ten Outstanding Filipino award for entrepreneurship in 1991. Other current independently owned small jeepney workshops and factories include Tandenrich Motors (Nagcarlan, Laguna), Armak Motors (San Pablo, Laguna), Celestial Motors (San Pablo, Laguna), Hebron Motors (Tanay, Rizal), LGS Motors (Pililla, Rizal) (Same company, Joint venture), Malagueña (Imus City), Mega (Lipa City), and Morales Motors (San Mateo, Rizal). Another manufacturer, PBJ Motors, manufactured jeepneys in Pampanga using techniques derived from Sarao Motors. Armak now sells remanufactured trucks and vehicles as an adjunct, alongside its jeepneys. The largest manufacturer of vintage-style army jeepneys is MD Juan. There are two classes of jeepney builders in the Philippines. The backyard builders produce 1–5 vehicles a month, source their die-stamped pieces from one of the larger manufacturers, and work with used engines and chassis from salvage yards (usually the Isuzu 4BA1, 4BC2, 4BE1 series diesel engines or the Mitsubishi Fuso 4D30 diesel engines). The second type is the large volume manufacturer. They have two subgroups: the PUJ, or "public utility jeep", and the large volume metal-stamping companies that supply parts as well as complete vehicles. Jeepneys can be flagged down much like taxis by holding out or waving an arm at the approaching vehicle. Sometimes jeepneys can be found at designated jeepney stands often with a "dispatcher" or "barker" calling out the destination and ushering in passengers, for a small fee paid by the driver. Routes are painted on the sides and below the windshield of the vehicles. Jeepneys are manned by one person, the driver, or by two people, the driver and the conductor (also informally called the "backride"). If available, the conductor manages passengers and takes care of fare collection. When only the driver is present, and passengers pass on the fare to other passengers who pass it along to the driver. The driver in this case, relies on the honesty of the passengers in paying their fare. Payment is done at the beginning of the ride for jeepneys plying urban, intercity routes where the fare is usually a single, flat rate. For intra-city routes, payment of the fare is usually done at the end of the ride. Because of the proximity of the passengers in jeepneys, jostling and shoving passengers is considered rude, and talking loudly and boisterous behavior is discouraged. Children are sometimes allowed to ride for free if they agree to sit on the lap of the accompanying adult and do not take up seating space. The elderly and women are offered seats first if the jeepney is full as male passengers could sometimes cling outside or sit on the roof instead (referred to colloquially as sabit in Tagalog and kabit or kapyot in Cebuano; both meaning "to hang on with your fingertips"). This practice is dangerous and illegal. To ask the driver to stop the vehicle, passengers can rap their knuckles on the ceiling of the jeepney, rap a coin on a metal handrail, or simply tell the driver to stop, e.g. in Manila saying para, po, from Spanish word for 'stop', a word rarely used outside of this context. Some prefer that the passengers call out the words rather than knock, as evidenced in the admonition painted on some jeepneys: Ang katok, sa pinto; ang sutsot, sa aso; ang "para", sa tao (Knocking is for doors; whistling is for dogs; para for humans). Some jeepney owners have installed buzzers operated by buttons or by pulling down a cable or string that run the length of jeepney's ceiling to alert the driver to stop, making it easier for the passengers. 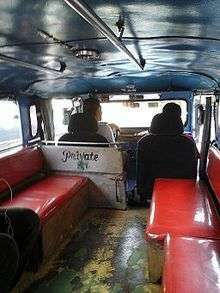 The jeepney is the cheapest way to commute in the Philippines. Because of its open rear door design, picking up and dropping off is easy for both passengers and drivers, they can stop anywhere unlike buses. But also because of this convenience, some jeepney drivers are the source of traffic congestion by indiscriminately loading and unloading passengers in the middle of the street, blocking traffic and risking the safety of some passengers. Some drivers engage in practices such as jostling over passengers, blocking other jeepneys to get passengers in the middle of the lane and trip-cutting (not completing the route, dropping off passengers if there are less than three to return to the jeepney stand and wait for a new set of passengers as it is not profitable for them to continue the route). Hence, some people are requesting that this mode of transportation be phased out, which is also blamed as a major source of air pollution in cities. Jeepneys are often mechanically unsound, and not at all roadworthy, with their balding tyres, crabbing and yawing from distorted subframes, with poor emissions. Their longitudinal seating and lack of any seat-belts is less than safe. The low height of the saloon, and the extended roof above the driver, make visibility very poor. The high step at the back and the restricted height make entry and exit difficult. In addition, they have little space for shopping bags. 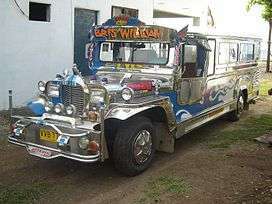 When American TV show The Amazing Race 5 came to the Philippines in 2004, a segment of jeepney manufacturing was one of the task involved in Leg 11 of the reality show. The episode, which was broadcast the same year, was shot at the Malagueña Motors factory in Cavite. A BBC television program in 2011 called Toughest Place to be a … Bus Driver, a London bus driver goes to Manila and had to experience driving a jeepney around the busy streets of city. ↑ In addition, when all seating capacity is used (perhaps 10 or 11 passengers each side) then up to three small wooden stools, euphemistically called 'extensions', are placed along the centre-line, with two passengers on each, sitting back to back. ↑ A jeepney consumes about 30 litres of fuel per day. 1 2 3 4 "Lifestyle Sarao Jeepney". The Philipines: The City of Las Piñas. Archived from the original on 7 May 2016. Retrieved 13 May 2016. ↑ Stuart, Godofredo U. "The Philippine Jeepney: The Undisputed King of the Road". StuartXChange. 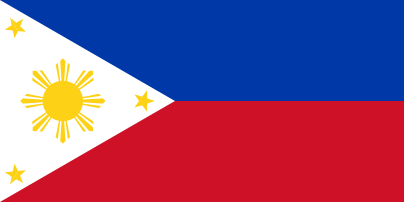 The Philipines. Retrieved 13 May 2016. 1 2 3 Mercado 1994. ↑ Otsuka, Kikuchi & Hayami 1986. ↑ "History of the Philippine Jeepney". 12 April 2012. Retrieved 10 October 2014. 1 2 3 Nicosia, Philip (31 July 2007). "Unique Jeepney Experience". Great Offers4u. India. Retrieved 14 May 2016. ↑ Philippine Daily Inquirer 2014. ↑ Sun Star Cebu 2013. ↑ Periabras, Rosalie C. (5 August 2015). "DOTC, PUJ operators tackle jeepney modernization". The Manila Times. Retrieved 26 April 2016. ↑ Badilla, Nielson S. (31 January 2016). "Groups to protest jeepney phaseout". The Manila Times. Retrieved 26 April 2016. ↑ De Vera, Ellalyn (17 April 2016). 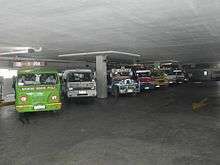 "LTFRB urged to shelve planned phaseout of traditional jeepneys". Manila Bulletin. Retrieved 26 April 2016. ↑ Lindsay, Greg (5 May 2016). "Can The World's Worst Traffic Problem Be Solved?". Popular Mechanics. US. Retrieved 13 May 2016. ↑ Michelle D., Santos. "Great Leaders in Our Midst - Mr. Leonardo S. Sarao, Sr". TOFIL Online. Retrieved 7 April 2013. 1 2 Charlene (5 December 2010). "The Jeepney". Strange Sensibilities. The Philippines. Retrieved 14 May 2016. ↑ "Jeepney Riding 101". The Pinoy Warrior. The Philippines. 12 November 2011. Retrieved 14 May 2016. ↑ "Philippine Public Transport & Driving Guidelines". Filipino-Western Relationships. ↑ Philippine Daily Inquirer 2010. ↑ Philippine Daily Inquirer 2008. ↑ Philippine Daily Inquirer 2012. ↑ "BBC Two Programmes - Toughest place to be a... Bus Driver". BBC UK. Bulatlat, Alexander Martin Remollino (April 24–30, 2005). "Drivers' Income Nosedives as Oil Price Soars". V (11). Archived from the original on 14 November 2006. Retrieved 9 October 2014. Chan, JeD (5 June 2009). "History of the Art in Philippine Jeepneys". Archived from the original on 9 October 2012. Retrieved 29 March 2013. Manila Bulletin, Kris Bayos (21 March 2014). "Bus rapid transit system eyed in Metro Manila". Archived from the original on 12 July 2014. Retrieved 9 October 2014. Manila Times, Katrina Mennen A. Valdez (25 January 2008). "Partsmakers plan local assembly of electric jeepney". Archived from the original on 28 January 2008. Retrieved 27 February 2008. Mercado, Leonardo N. "Chapter X: Microcosms, THE JEEPNEY AS MICROCOSM". In George F. McLean. The Filipino Mind. Cultural Heritage & Contemporary Change. Philosophical Studies II. Council for Research in Values and Philosophy. ISBN 978-1565180635. Otsuka, Keijiro; Kikuchi, Masao; Hayami, Yujiro (January 1986). "Community and Market in Contract Choice: The Jeepney in the Philippines". Economic Development and Cultural Change. 34 (2): 279–298. doi:10.1086/451528. JSTOR 1153851. (subscription required (help)). Philippine Daily Inquirer, Mario B. Dalu (10 June 2008). "Is it finally time to phase out jeepneys? (opinion)". Archived from the original on 11 June 2008. Philippine Daily Inquirer, Reynaldo D. Pagsolingan (29 September 2010). "Jeepneys should be phased out in the Metro (opinion)". Archived from the original on 1 October 2010. Philippine Daily Inquirer, Jason K. Ang (12 September 2012). "Finally, a cleaner jeepney". Archived from the original on 15 September 2012. Retrieved 9 October 2014. Philippine Daily Inquirer, Miguel R. Camus (4 July 2014). "Bus Rapid Transit system planned for Metro Manila, Cebu". Archived from the original on 4 July 2014. Retrieved 9 October 2014. "Jeepneys in the Philippines". 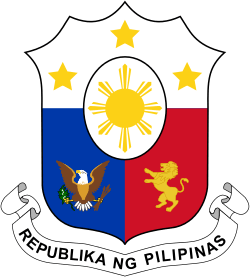 Philippine-portal.com. Archived from the original on 7 December 2008. Retrieved 5 December 2010. Reuters, Karen Lema (20 November 2007). "Manila's jeepney pioneer fears the end of the road". Archived from the original on 8 December 2015. Retrieved 27 February 2008. Sun Star Cebu, Rebelander S. Basilan (20 April 2013). "Cebu's bus transit being tested in NCR". Archived from the original on 22 April 2013. Retrieved 9 October 2014. Italics indicate defunct, proposed, or under construction.